Skype is the most popular instant messenger which was bought by Microsoft and then Microsoft combined it’s Windows Live Messenger with Skype making it more popular than ever. Skype comes for almost all the platforms including Windows Desktop, Modern Windows app, Mac OSX, Linux, Android, Windows Phone etc. Skype has been silently updated to a newer version 7.1.105. When I went to Skype menu and checked for updates, the new update was not showing up. So I had to download the full installer of Skype 7.1 and then did an upgrade install in the existing installation of Skype in Windows. We've updates Skype so you have the latest version - including performance improvements and general fixes. Other than this announcement, I was unable to find any changelog or new features being discussed for Skype 7.1. 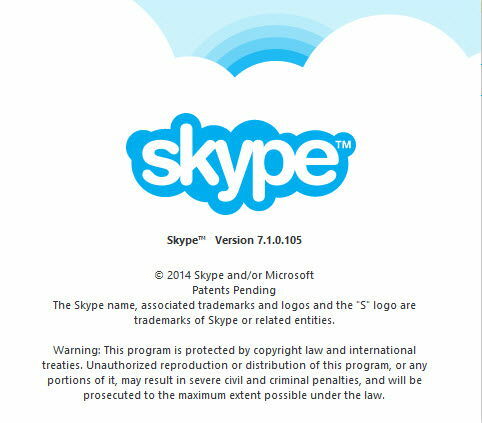 All your links to different Skype versions are fake or dead. 7.1 fixed a bug that was preventing Pamela Call Recorder from working with Skype. That’s the only change I know about.